The Moscow State University (MSU) jumped 35 places to 161st in the latest Times Higher Education (THE) World University Rankings. The total number of Russian universities listed increased from 2 to 13. 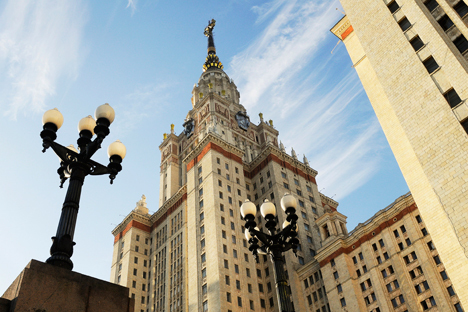 The Lomonosov Moscow State University (MSU) was ranked 161 out of 800 in the Times Higher Education (THE) World University Rankings 2015-16, which were released on October 1st. 13 Russian academic institutions made the list this year, compared to just 2 in the 2014-15 rankings. MSU was once again ranked highest among the Russian universities. Last year, MSU was ranked 196 out of 400 (the list was expanded to 800 universities this year). The only other Russian university that was in the list last year was the Novosibirsk State University, ranked in the 301-350 position. This year, it fell in the rankings to 401-500. In the 2015-16 rankings, the Russian top 5 also included the Peter the Great St Petersburg Polytechnic University (201-250), the Tomsk Polytechnic University (251-300), the Kazan Federal University (301-350) and the National Research Nuclear University MePhi (301-350). "It's great that Russia has 13 institutions in this list, with five of its universities sitting within the top 400," says Phil Baty, Editor, Times Higher Education World University Rankings. Russian Deputy Minister of Education Alexander Povalko praised the fact that more Russian universities entered the rankings, and said he was hopeful of even better results next year. "Universities are investing into their scientific research base and are recruiting the best people to enhance their international competitiveness," Povalko told RBTH. Novosibirsk State University (NSU) Rector Michael Fedoruk said his university has been rising in the ranking by subject category because of the quality of fundamental research work it carried out. He attributed the fall in the general ranking of the university to a slight change in methodology. Nikolai Kudryavtsev, Rector of the Moscow Institute of Physics and Technology (MIPT) also cited the change in methodology and added that this year, THE apparently did not take into account scientific publications that have many co-authors. According to both rectors, when it comes to physics, it is impossible to carry fundamental research with a small group of scientists. For major results, substantial investment and big teams are required. Another obstacle that comes in the way of Russian specialized universities, like NSU and MIPT, climbing quicker in the general rankings is the limited number of humanitarian courses they offer. "We only have three specializations in our institute: physics, mathematics and informatics,” Kudryavtsev told RBTH. “It's very hard for us to deliver a better result in the general rankings.” He added that the institute's ambition is to get to the top 25 of the physics ranking. Last year's THE Physical Sciences Ranking included MSU (56), NSU (85) and National Research Nuclear University MePhi (95). A major factor that contributed to the success of Russian universities this year was their cooperation with both international and Russian companies like Boeing, Siemens and Uralwagonzavod. Victor Koksharov, Rector of the Ural Federal University says such cooperation plays a major role in the development of the regional economy. Peter the Great St Petersburg Polytechnic University, which built the best university engineering center in Russia, cooperates with companies like Porsche. "Our research in the field of innovation is used in shipbuilding, aircraft building, aviation and transport systems," the university’s rector Andrei Rudskoy told RBTH. THE rankings reveal universities in Continental Europe are catching up with their Anglo-American counterparts. ETH Zurich (9) is "leading the pack as the first institution from outside the US and UK to make it to the world top 10 in a decade," THE said in a press statement. Asia showed mixed results this year with Japan and South Korea falling and China remaining stable. Japan has 41 institutions on the list, China has 37, South Korea and Taiwan both have 24, while India has 17. The top university from Asia is the National University of Singapore (26) followed by the Peking University (42) and the University of Tokyo (43).